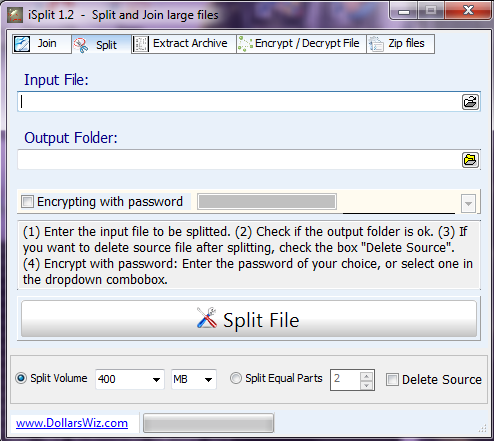 This software will enable users to easily split their files into several pieces while also being able to password-protect the output files. (1) Enter the input file to be splitted. (2) Check if the output folder is ok.
(3) If you want to delete source file after splitting, check the box "Delete Source". (4) Encrypt with password: Enter the password of your choice, or select one in the dropdown combobox. (5) The password in combobox can be created in "notepad.exe", and save as "password.txt" in Unicode format. Assuming you are using a unicode password. (6) Any new password entered will be automatically saved in the combobox. (7) Extract archived files in the following formats: 7z, rar and zip. (8) Encrypt and decrypt file with password protected. Although, I do most of the work. However, there are some code segments were collected on the internet. I do not take all the credits for them.